To Tommeliten on the "Ships starting with T" page. Source: Bjørn Milde's postcard collection, who has also provided me with the building information (his source: Bergen Maritime Museum). Received from Kor Kok, who in turn received it from the grandson of the original owner of the shipyard (the picture is taken in front of the shipyard). Built by J. Th. Wilmink, Groningen, The Netherlands in 1916 for Sigurd Helmers Olsens Rederi, Bergen, who owned her until 1925. She subsequently had 2 more owners before Eyvind Marcussen took over in 1939. 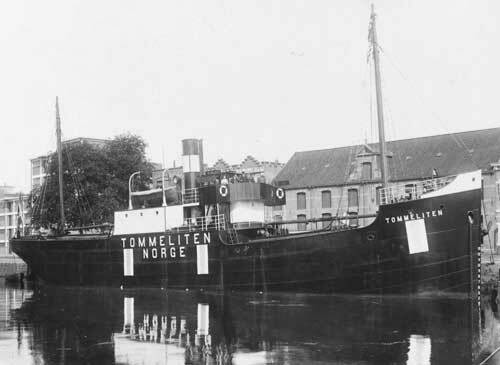 According to this external page, she was delivered in May-1916 as Tommeliten to Sigurd Olsen, Bergen. From Sept.-1920, owned by Sigurd Helmers Olsen, Bergen, no name change. Owned from 1927 by A/S D/S Tommeliten (Sigurd Helmers Olsen), Bergen, same name. From 1933, A/S D/S Tommeliten (Rasmus F. Olsen), Bergen. From Dec.-1935, A/S D/S Tommeliten (Tomas Maaren), Bergen, then from 1939, D/S A/S Askerøy, (Eyvind Marcussen), Askerøy. 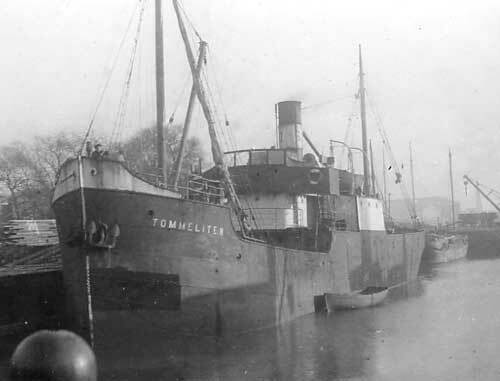 As will be seen when going to Page 1 above, Tommeliten got out of Norway shortly before the German invasion, which took place on Apr. 9-1940, and thereby ended up in Allied control. Apart from a voyage to Brest and another to Cherbourg that spring, she was subsequently in service around the U.K. It'll be noticed on the archive document that she appears to have spent a long time in Hull that year (unless some voyages are missing). She had arrived there on July 5-1940 and departure is given as Oct. 6. Her 1941 voyages also start on this document. Not much convoy information is available for this ship. She's listed, together with the Norwegian Cresco, Heien, Inger Elisabeth, James Hawson, Jernland, Lyng, Rimac, Røyksund, Selvik, Varangberg and Vigrid, in Convoy EC 2, which departed Southend on Apr. 3-1941 and arrived Clyde on Apr. 10; according to Page 2, Tommeliten arrived Harwich from Southend on Apr. 3 - the external website that I've linked to below has the names of other ships in this convoy. What strikes me when looking at her voyages, is that they were generally very short, and though she did occasionally spend a few days in port, it looks like her crew did not get much chance to go ashore in between voyages. According to Page 18, she was in Gravesend on VE Day, May 8-1945, having arrived there from Rochester on May 4, leaving again on May 10, so this was one of those times when she spent a few days in port. From Page 19, we learn that she got to go home to Norway already in July-1945, making a few more voyages home before the year was over, and again in Jan.-1946 (see Page 20). Sold abroad in 1949 and deleted from Norwegian registers. According to this external page, owners in 1949 were Hans Fredrik Ugland, Arendal, still as Tommeliten. From Nov.-1949 sailed as Themsby for Tyson, Edgar Shipping Ltd., London. Sold in 1950 to J.P. Hepworth Ltd., Hull for breaking up. Convoy EC 2 - (Based on Arnold Hague's database). Back to Tommeliten on the "Ships starting with T" page.